Serial hugger. Anywhere, anytime, a hug could come your way. Going to get a drink of water in the kitchen? Watch out, the hug interceptor might stop you in your tracks. A hug here, a hug there, frequent hugs would suit him just fine. 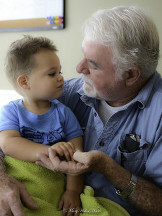 One week with two-year-old grandson Joseph was chock-full of hugs. Hugs were on the daily agenda. From finishing breakfast to reading to riding on the power wheelchair, Poppa found a way to sit with Joseph so his arm was around him He was the same when his children were young only then he didn’t have ALS, his style of hugging was different, more robust. Hugs are not just for the young in his life. He still hugs his adult children. When he first meets a person he might just give them one. Who am I kidding? He will give them one. When you meet Tom just be prepared for a hug, and hurry if you want one. We have a family hug Tom created many years ago. I have no recollection of when he started this tradition. It was probably when the kids were teenagers when they did nothing but irritate one another. We could all be in the kitchen, minding our own business, and he would randomly call a family hug. The kids on either side of us, in a circle, and our arms around each other, until the kids broke free because they couldn’t take one more second of it. They never refused the family hug even when they didn’t want to. We all knew, and know, how hugging just rocks for Tom. We even have a family hug in absentia. When one of us isn’t there we leave a space, an empty place in the circle. The missing has always been Sean, our son, who hasn’t been with us for a thousand, or more, family hugs. He’s active duty, part of The Long War, and deployed more than not. ALS is stealing the power of his hugs. This week, for the first time, when we hugged, his arms lacked the ability to hold tight. He has always been the hug initiator. When he can’t lift his arms anymore for random acts of hugs I’m going to have to step up my game and assume a new role.